English: Pin-tailed nonpareil, long-tailed munia; French: Diamant quadricolore; German: Lauchgrüne papageiamadine; Spanish: Pinzón Loro de Cola Aguda. Male: 5.9 in (15 cm); female: 4.5-4.7 in (11.5-12 cm). Sexually dimorphic. Males have a longer tail, a blue face, and red rump, tail, and belly. A yellow variant exists where the red is replaced with yellow. Females have less blue on the face, shorter tail, and a lack of red on the belly or breast. Juveniles resemble females but have a yellowish lower bill. Found in forest edges, secondary growth, rice fields, and bamboo. Usually found in small flocks, but larger flocks can form especially in rice fields. The call is a "tseet-tseet" or "tsit-tsit" while the song is described as a series of clinking, crackling, and chirping. 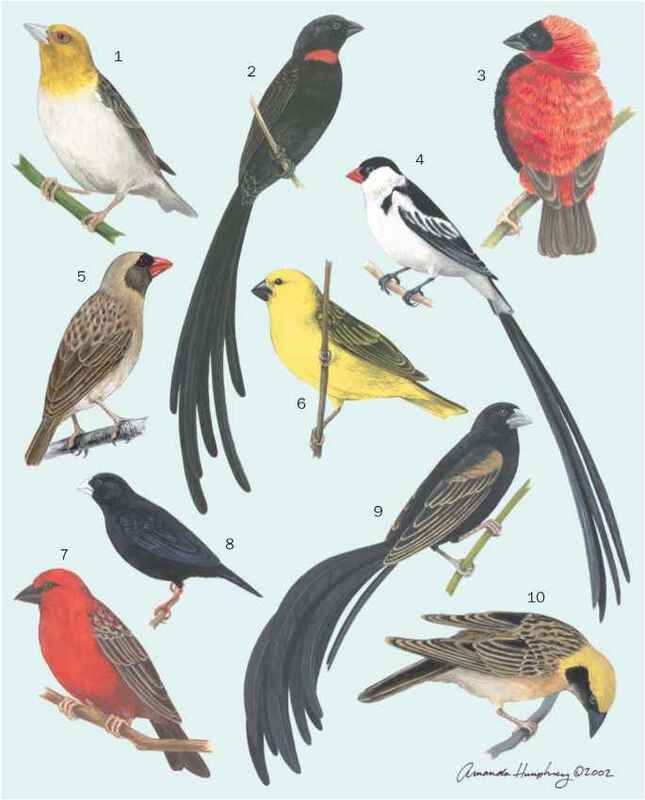 This species has only been observed feeding on rice or bamboo seed heads in the wild, but in captivity it takes a diversity of seeds as well as leafy green vegetables. The round nest is built at variable heights and is made of bamboo blades and other plant fibers. Four to six white eggs are incubated 12-14 days.